Meeting at the Tbilisi International Airport. Transfer & Accommodation to the hotel "VARAZI”. 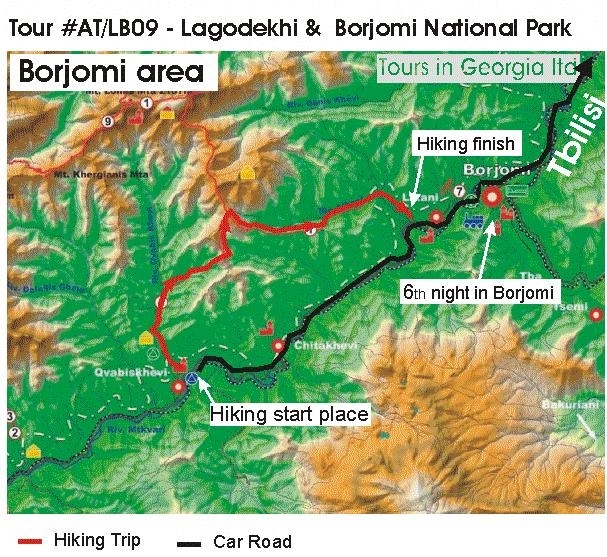 City tour in Tbilisi and excursion in old capital of Georgia Mtskheta. 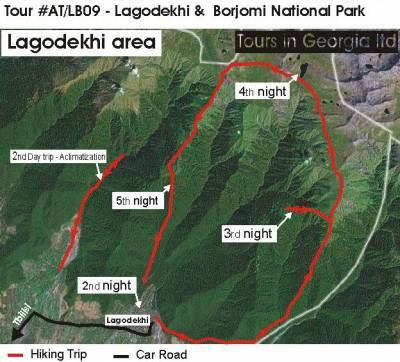 After arriving and accommodating in Lagodekhi (little town In Kakheti district) the journey will pass through the easy rote (14km.) to the waterfall (geight 40m.). At the same time the tourists take acclimatization. The circle rote. The tour duration is 3 days. The jorney will pass through the goodliest and unique wide-leaf trees and light forest. Alpine and subalpine meadow and the lakes in the high mountains. The entrance into Lagodekhi Protected area from Lagodekhi ravine. On the way we’ll see the weather-station, Mitos seri (2321m. ), Mt. Prince (2849m. ), Kbala-Kbeli lake and Kaputsikhe (2176m.). During the journey the highest eminence is 2900m. Spending night – in tents, 5th day – Gust House. Places to visit: Jgvis Monasteri in Mtskheta, Stalini house museum in Gori and Upliscikhe Castle. Spending night – Guest house in Borjomi. 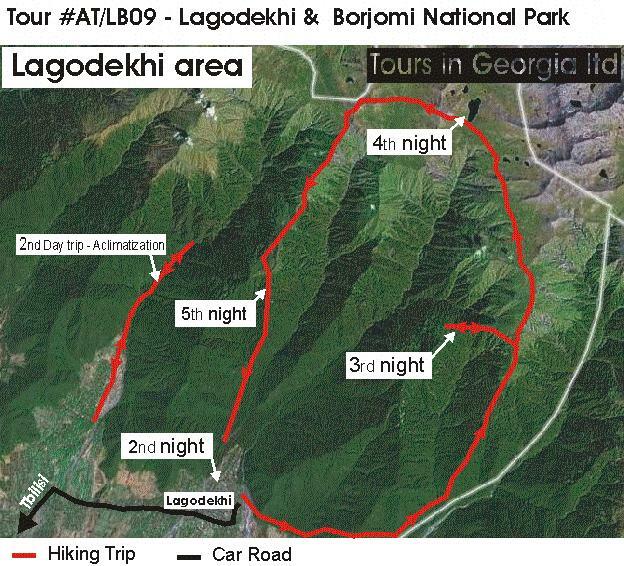 Hiking trip: Kvabiskhevi – Likani. Highest place on this trip – 1950 m.
Spending night – Hotel VARAZI 3*. · Accommodation during the tour: in hotels, guesthouses, tents and shelter for tourists during hiking. · Fin party in the Georgian restaurant.